Imagine everything you grew up believing was lie. Imagine your best friend was a talking cat with a penchant for bad movies. Imagine there is an entire world beyond the one you know and you just discovered you’re connected to it by blood. Welcome to Gabriel Ehmm’s world and the wildest treat this side of the afterlife. 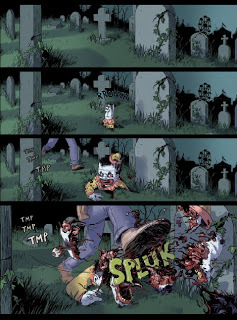 Gabriel Ehmm finds himself thrown into a world of talking animals, zombie midgets and the fat man calling himself Saint Peter. The adventure begins here by blowing your brain off in an action-packed issue that’s bound to mess your face up! Ehmm Theory is a wonderful mix of horror and humor written by Brockton McKinney. It is about Gabriel Ehmm who gets his head blown off by his girlfriend and winds up being told by St. Peter in a kind of shady meeting he has to go back as a ghost and try to figure out why a bunch of zombie midget clowns are rising from their graves in a small carnival town. He also has to find his biological father to help guide him to salvation and get into heaven. Oh, his side kick is a talking kitten, Mr. Whispers. I love the cartoon flair to the art work by Larkin Ford. There is great carnage detail to the zombie killing scenes and facial expressions throughout. This is the first in a series and they managed to set up a couple of plot threads while keeping the story fast paced. It was over before I knew it! “It's a play on the "M Theory" hypothesis that is a derivative of String Theory. Basically the idea that there are multiple universes separated by a sort of membrane. Ehmm Theory is a new series that will be out in May so be sure to contact your local shop and let them know you want a copy. You can also pre-order right now with code #MAR130763. 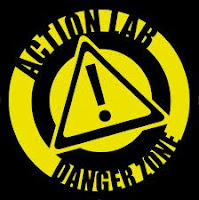 Action Labs: Danger Zone comics! 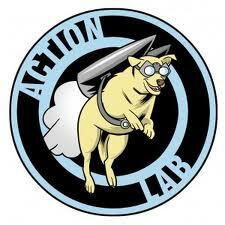 seriously, the best logo EVER! Nice comics. I'm definitely getting a copy of this. Cool! ALC puts out some quality stuff in general.